Quail is a common game bird. People eat it all the time. And sometimes when they eat it, their muscles disintegrate and their kidneys give out. Learn how these birds periodically turn themselves poisonous. 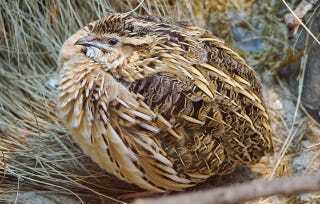 The common quail lives all over Europe. Every year it migrates down to northern Africa. That’s an impressive feat, and a dangerous one, considering the quail is an extremely tasty animal. Hunters regularly hunt quail, including migrating quail. Occasionally, hunters get a very nasty surprise. A little while after eating the quail, their muscles get sore, weakening and swelling up at the same time. Soon afterwards they get nauseous, and their heart races. Confusion and disorientation set in, and then all-over body pain. But even the most confused and pained person knows that when their urine turns dark brown, it’s time to go to the doctor. What they’ve got is rhabdomyolysis. Their muscle tissue has begun to degrade, and its components are forced into the bloodstream. This throws off the electrolyte balance in their body, which is part of what leads to their nausea and confusion. Meanwhile, the proteins in their bloodstream are shutting down their kidneys. Although rhabdomyolysis can be treated, it can also be fatal. How does a quail turn itself into a weapon? On their migration, the quail eat whatever is on hand, and one of the plants they often find is hemlock. Hemlock is poisonous to us, but not to the quail, which gorge themselves. Not all quail are poisonous during their migration, but the sickness, coturnism, is a common enough phenomenon that it was remarked on by Aristotle. People haven’t stopped eating them, though. Hunters and their dinner guests still regularly show up at hospitals with coturnism. That must be one delicious bird.